What are Votive Candle Holders? Votive candle holders are candle holders which are designed to accommodate votive candles. These candle holders come in a range of shapes and sizes, and they can be made from glass, metal, wood, stone, or ceramic. Many home supply stores carry votive candle holders, and they can also be ordered directly through companies which specialize in candles and lighting, or made in a workshop, for people who enjoy crafting their own décor items. The term “votive candle” is used in two different ways. In the first sense, a votive candle is a devotional candle which is used in religious worship, classically in Roman Catholic and Eastern Orthodox churches. These votives can be made from paraffin, beeswax, or other waxes, and they are typically lit by visitors to the church as part of the prayer process. In the second sense, a votive is a round pillar candle of standardized size, usually two inches (five centimeters) high by one and a half inches (roughly four centimeters). Many religious votives fall within this standard size, but they can come in other sizes and shapes as well. 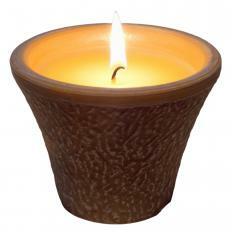 Votive candles are very similar in style to tealights, but tealights are smaller, and enclosed in a metal casing. Candle holders designed for votives are often very tall, allowing the candle to burn freely without guttering in the wind. Some have religious themes, and are designed for use on the altar, while others are secular in nature. A classic votive candle holder consists of a tall glass cylinder with a closed bottom, with the glass being clear or colored. These small candles do not give off very much light, being most effective when they are burned in large clusters. People can use votive candle holders to burn a large display of candles in a relatively safe way, since it is hard for flames to leap out of traditional tall votive candle holders. An array of votives can also be used to create a variety of atmospheres at parties and other events, depending on the type of holder used. In addition to the basic candle holder style discussed above, it is also possible to find votive candle holders shaped like lamps which can accommodate a votive, along with candlesticks, candle trays, and candelabras which have been designed to accommodate votives. In many cases, a votive candle holder can fit tealight candles, for people who like more versatile candle holders, and many votive holders can also hold taller pillar candles. How do I Become a Candlemaker? What Should I Know About Making Candles?